My daughter will revolt if we don't have these at Christmas time! Dough Chills for 4 hours. Then preheat oven to 375. Beat butter and sugar until creamy. Beat in egg, vanilla, and mint extract. slowly mix in baking soda, salt, cocoa and flour. Divide dough in half. Shape each piece into a log 1.5 inches in diameter. Wrap in plastic wrap and chill for 4 hours. Slice each log into 1/8th to 1/4th inch thick slices. Place on parchment lined cookie sheets. Bake 8 to 10 minutes. Cool cookies. Beat butter until creamy. Add powdered sugar, milk and mint extract. 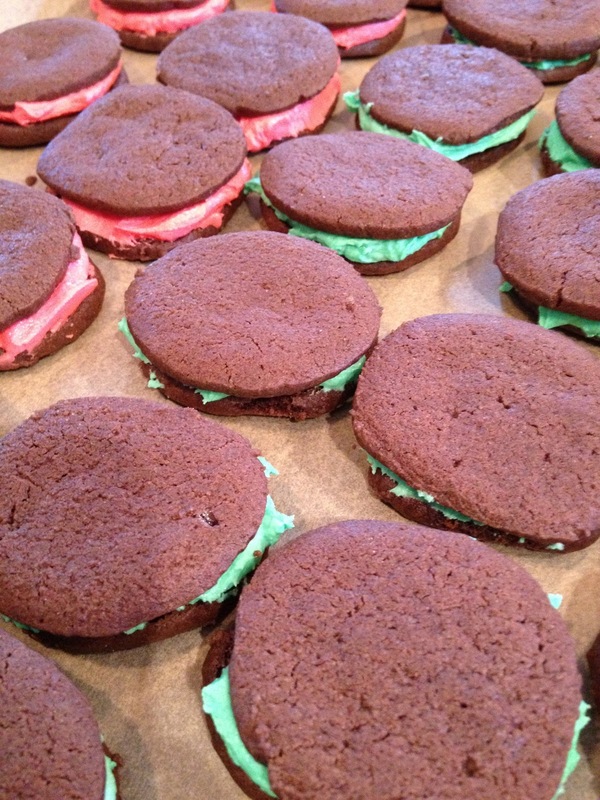 If using food coloring, divide frosting in 1/2. Mix in red and/or green food coloring. Spread bottom of cookie with frosting. Top with another cookie.